As we know that we use magnetic contactor for many types of controlling systems, in this post you will watch a magnetic contactor animation diagram. In the magnetic contactor working animation diagram, you will see the internal working structure of a magnetic contactor. 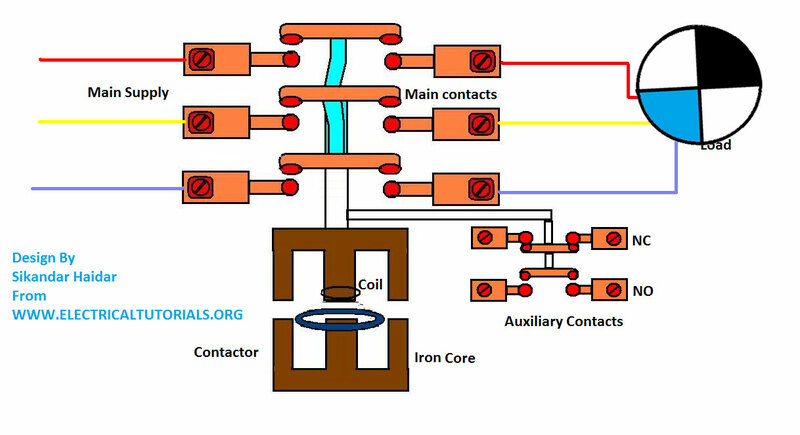 In the contactor animation diagram, the contactor internal main contacts and auxiliary contacts are shown. Here you can see the contactor animation diagram part 1. This is the first part of magnetic contactor animation diagram, now let's move to the Second diagram. In the below magnetic contactor animation diagram is shown that the magnetic contactor coil are energized and the motor/load is start. Now I hope the above magnetic contactor animation diagram help you to understand the working principle of a magnetic conductor. And after this diagram now you will be fully understood that how a magnetic contactor works. Now if you have any questions regarding this contactor animation wiring diagram then you can easily submit your question in the below comments box. What is auxiliary contacts in magnetic contactor?